When a beach fence suddenly appeared at Xanadu Island Resort, a number of people were shocked. 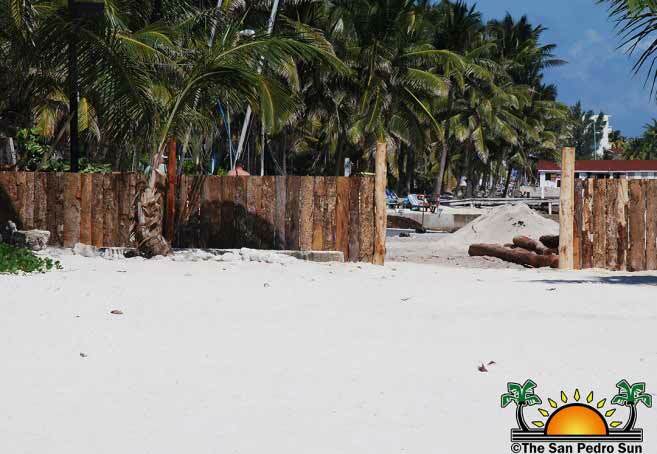 Since its construction, residents have been complaining that the fence makes the beach less accessible, while Xanadu claims its intention is to protect their guests. Residents have reached out to the Ambergris Caye Building Authority (ACBA) to ask them to enforce the 66 feet rule, which is the law that applies to beachfront property. According to Fidel Ancona of the ACBA, the resort did not obtain a permit to build the structure, but Mayor Daniel Guerrero gave them special permission. “We received some calls from people concerned about this new fence on Xanadu’s beachfront, and there’s a lot of frustration. We did not authorize or issue out a permit for them to build the fence, but Mayor Guerrero is fully aware of the fence” said Ancona. Mayor Guerrero stated to The San Pedro Sun that the fence it is only temporary. “The fence is temporary until the construction that is happening there is completed. Xanadu actually wanted a higher fence, but we told them they cannot build higher. It is illegal to block the beach side, but they have obtained special permission to do so. There’s no exceptions, the fence will have to be removed as soon as the construction is done in the area,” said Guerrero. Undermining the Ambergris Caye Building Authority (ACBA) authority is and insult to Fidel and special permissions given out by the mayor or our area representative are always suspect of corruption. The Mayor needs an adviser to avoid these sticky situations, trying to make everyone happy is difficult and a strong line of no special permissions needs to be drawn or accusations of bribes are sure to follow. Danny is a good mayor but to get reelected he'll need to avoid circumventing the laws and regular channels and delegate/forward these requests for permits and permissions to the appropriate authorities. This will allow him to keep the good guy face and any disgruntled applicants can blame the authority and not Dannyboy.